Samsung doesn’t want any more drama with its exploding Galaxy Note 7. 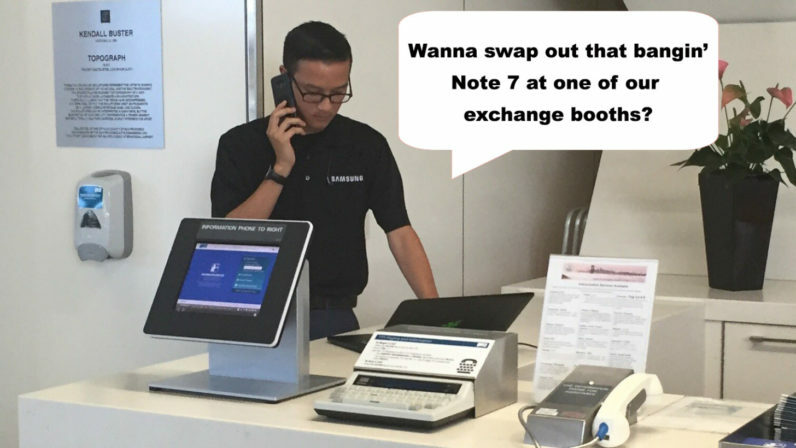 The South Korean giant is setting up exchange booths at airports around the globe to offer customers a chance to swap out their Note 7 phones before boarding planes. That way, the company hopes to avert catastrophe and prevent one of its hazardous devices from blowing up in the air. Samsung initially launched its new exchange ‘customer service points’ in South Korean airports, but has since confirmed booths are opening across “high-traffic” terminals in Australia and the US. There, customers will have the opportunity to return their faulty Note 7 device and claim another Samsung device – much like the regular exchange program the company is currently running. The booths will be especially handy at US airports, where passengers are no longer allowed to check in their Note 7 phones on board. For safety’s sake, it’s best if you switch out your phone before you get to the terminal; but in case you can’t – at least you got options. Samsung recently halted sales of the faulty device before eventually discontinuing the Note 7 altogether. Since then, the Federal Aviation Administration officially banned the device from airplanes, making it a federal crime to bring the Note 7 on board. So if you don’t feel like spending up to ten years in prison – better take advantage of those exchange booths next time you’re thinking about flying with that fire-catching Note 7 in your pocket.